The Nokia N95 has arrived! And it is running pfingo! It syncs with my Mac! And I am having a good time playing with it. So far, so good. Very nice feel. We will be doing a proper WTF! show review on it soon. The screen changes orientation very fast, when you slide the keyboard out or the media buttons out. I also liked the use of a regular headphone jack and mini-USB connection. The included charger is the smallest I have ever seen from Nokia, also appreciated. I couldn’t get the GPS to work properly, will try again later. The photos from the 5 megapixel camera look gorgeous but there is a slight pink tint on them. Hope they fix that in a firmware update soon. The sliding mechanism is very firm and smooth. I was using an E65 for a spell because of the pfingo trial, and I liked the E65’s slimness and leathery skin, and also the heft. Compared to the E65, the N95 actually feels lighter. Odd. 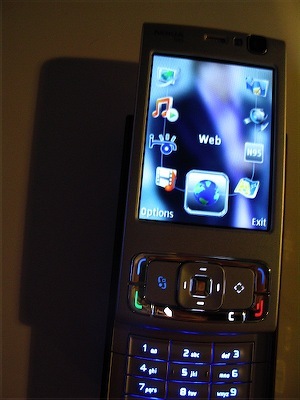 While I like the N95’s feel, I preferred the E65’s size, heavier weight, and feel in my hands. Felt less plasticky. Oh, and the E65 has Active Standby Plugins! Very useful addons to the Active Standby feature! Got to get that installed on my N95, man. Meanwhile, I have it set up for Starhub’s new pfingo VOIP service. 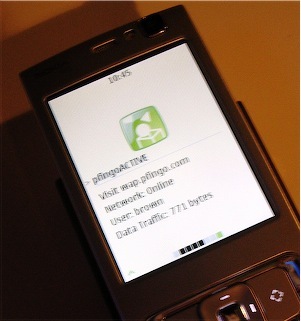 pfingo (the “p” is silent, and yes, there will be many “pfingo me, leh” jokes, for sure) lets you use wifi to make phone calls, and comes with a 3 series telephone number (3 series telephone numbers are reserved for VOIP) so that you can make local calls and IDD calls via your wifi-enabled mobile phone (like the Nokia N95 and the E65). This means it is telco independent (it does not matter if you are on Singtel, M1 or Starhub because the calls and the pfingo services work on broadband, not the cellular network). You just need to connect your phone to a wifi hotspot, or to your home or office wireless network, to make and receive the calls. Something like a Skype for your mobile. pfingo also comes with some Java widgets (that look a lot like Mac icons, haha) which converge your email, contacts, calendar, RSS feeds and even MSN chat onto your phone. These extra services work with either wifi or 3G connections from your phone. Very nice touch. You can synchronise your Outlook with your phone, and also add up to 5 email accounts to pfingo Mail, which pushes email to your phone. Kinda like making your Nokia N95 into a Blackberry. Also very cool. I even managed to get it to sync with my Mac via iSync, with a little help from Paul Reames’ excellent plug-ins. You can get the plug-ins for the N95 (and other Nokia phones like the E65 which are not yet supported by Apple) from Paul’s site at www.s60themes.co.uk. Note there are separate versions for iSync 2.3 and 2.4. I had some problems making the plug-ins work at first, but with Paul’s help, we realised that it was caused by my version of iSync that Apple put into my Mac when I upgraded to OS 10.4.9. So a warning to all of you, back-up your older version of iSync before you let Software Update upgrade your Mac, or you may find that some of the plug-ins you were using or planned to use, will break.